I veered away from my traditional strawberry pie this summer to try one that tempted me from the pages of Southern Living. It was a last minute decision, so I cut a few corners regarding the pie crust and whipped cream; that said, it was still delicious ... Mike went back for seconds the first night it was served if that gives you any indication that it was a hit in our house ; ) Although fall is right around the corner, it's not too late to enjoy this summer dessert! Gently fold in Cool Whip. Spoon into prepared crust. Cover and freeze 8 to 12 hours or until firm. Is she watching? Can I get away with this? I'm queen of the woooooorrrlllddd!! Friday Funny: Hello Stranger On the Street, Could You Please Tell Me How to Take Care of My Baby? 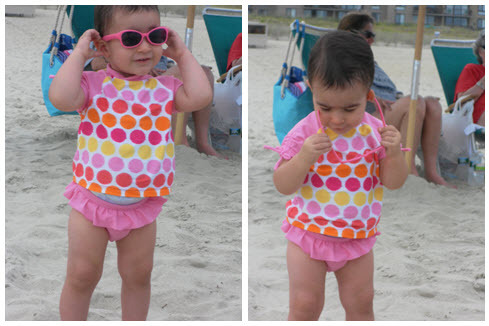 2012 toddler all the way! "Doh, technology can be so confusing sometimes!" We pardon your regularly scheduled Anna programming to bring you news that on or around March 10 our little star will be sharing the spotlight ... that's right, Anna is going to be a big sister! 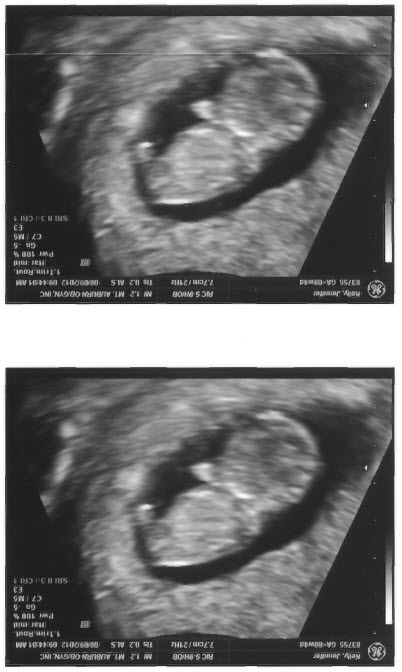 We couldn't be happier and think it will be twice as nice with two under two, and (approximately) twenty-two months apart! Someone once said that the best things in life are surprises and I wholeheartedly believe that's the case, and it happens to hold true with this news; for someone that was told before starting chemo that there was a slim chance I'd be able to have children of my own, we'll take it anyway we can get it : ) I'm 15 weeks and so far have had a fairly textbook pregnancy, knock on wood. That said, with a toddler underfoot, things are a bit different, as I know all you Moms of 2+ can agree. Although I've been able to squeeze in a few weekend naps and did hit the hay a little earlier during the first trimester, long gone are the days of lounging and daydreaming about that little bun baking in your oven. I dealt with some fairly bad allergies over the summer, which were complicated by the pregnancy hormones, and had a touch of nausea (mine comes in the afternoon), here and there, but nothing to complain about. I'm starting to show (still in the questionable, maybe she's had a few too many donuts phase) and revealed my news at work this, so maternity pants are right around the corner. Because we loved being surprised with Anna's gender, we don't plan to reveal with this pregnancy either. Don't worry about lack of pregnancy projects, though, I'll get to spend my time decorating Anna's big-girl room since the nursery will remain mostly untouched. Being a big sister sounds cool, but these elephants are pretty neat too! Wow, what a month it’s been, you travelled to be beach and back and I swear you turned into almost a new, more grown-up little girl, along the way. You’ve physically been growing like a week; at your 15 month appointment we learned you’d grown 3 inches and gained 3 pounds in 3 months. Insane! You’re now in the 25-50th percentile for weight and the 50-75th percentile for height. You’re finishing out the summer in your 12 or 12-18 month clothing, but are quickly moving into your 18-month fall attire and wear about a size 5 shoe. Your hair is getting LONG, all around, but especially in the back. I’m still not keen on cutting it because it curls up and looks adorable. You have all of your one-year molars and your tooth count now stands at 11 in total. It doesn’t just seem like you’re getting big, you ARE getting big! You’ve started to show affection and preference in different ways over the past month. You now hug and kiss on command all of the time, but more often, not on command. You are such a loving little girl! You can now offer closed-mouth kisses and sometimes make the “muah” sound, it’s simply adorable. When you want my attention you will now physically push me from whatever I’m doing, including sitting in a chair, position me so that you can stand at my feet and will put those little arms up. Yes, it’s frustrating at time, especially when I’m trying to get one last e-mail out for work or chopping veggies for the week’s dinner, but I sure can’t resist that sweet face that smiles up at me when I look down. You LOVE animals. I can’t even express how much you love them without sounding like a broken record. You love the cats, that’s a given, but you also really love dogs. When we’re outside walking or playing and you see a dog, you call out “oooooooohhhhhhh” in the sweetest voice. When we returned from vacation you ran around the house for a good 30 minutes yelling “Hiiiiiiii!” and chasing the cats through the house. And your love for animals doesn’t stop there. You are on the verge of becoming the youngest hoarder on record with your stuffed animal collection. You sleep with a puppy that your Paw Paw got you for your birthday and I dread the day he gets lost, worn out or needs to be washed; he routinely watches you eat breakfast and follows you on your morning adventures, I guess sometimes it’s just too much for you to leave him in your crib all alone. You had a blast on vacation this year. Grandma, Grandpap and Uncle Sean joined us and you loved everything about the trip. Minus a little bit of the driving, but who doesn’t get bored in the car? You were great at sleeping in your pack-n-play in a few different locations and slept-in later than everyone else on several occasions, so much fun wears a girl out, I guess. You and Grandma took walks into town a few mornings and went to see the dolphin statues each day. You loved walking on the beach with Grandpap and letting him assist you in the pool with your float. And you loved everything about Uncle Sean being there, I don’t know what it is, but you two connect and have the best time when you’re together. It was a real treat to spend so many consecutive days with family that live further away and I’m SO glad you are able to bond with them and create so many fun memories. Your personality is developing more and more each day. You have an awesome sense of humor, but on the flip side, someone along the way told you that you were already a 2-year-old and we’ve seen a few fits of fussiness that have me worried. It doesn’t help that you’re incredibly smart. Case in point, on vacation you knew exactly how to walk the 15 feet from our condo to the beach access area and any time we were on the promenade you expected a trip out to the sand and surf; even if we were dressed for dinner and had spent the entire day at the beach. If you weren’t allowed, you weren’t happy. Luckily these instances are few and far between, but I'm already bracing and stocking the wine cellar for your teenage years. You have a tiny shy streak, but are generally very friendly and hardly meet a stranger. On vacation there were several toddlers your age and you weren’t afraid to go up holler “Hiiiiiiii” and ask them to play in your own language. If anything, you were a little too forward, but I’ll take that over a shrinking violet any day. You love an audience, you love friends and you love being around those you love. Your laughter and smile are infectious and you literally light up the room when you enter. You’ve become a bit of a daredevil lately and love to test your limits. A favorite “thing” is to fall backwards, into someone’s lap, arms or a pillow. Thank goodness you’re never left alone because you don’t always know your limits or make the smartest choices; you’re a toddler after all. On a recent evening you were standing on the couch, looking out the window with your Dad and me and decided you’d like to free fall backward. Of course we caught you. As we all sat there, your Dad and I trying to explain to you why the free fall wasn’t safe, and you not understanding and loving the game you’d invented, I thought, in that moment, *this* is one of SO many instances where we’ll catch you in life. You may not always like the answer or advice we give you, but I hope you know that we’re always here for you and will ALWAYS catch you when you fall. Vacation, all I ever wanted ... Vacation, had to get away! We had a wonderful time at the beach last week, it's always great to get away from the real world for a few days to relax and recharge. There was great weather, great company, a great condo .... pretty much a great week all around! Mike grew up mostly going to Bethany Beach, DE and since Pittsburgh is a great stopping point for us in our landlocked state (every decent beach is 10-12 hours away) it was a natural choice. As an added bonus, this time we were able to pick up Grandma and Grandpap to join us in a week of fun in the sun. We went to the same beach last summer, during the same Labor Day week, and loved that the weather was still warm, but not hot, while the rates were cheaper, the beach was less crowded, and the restaurant waits were basically non-existent. Until we're slaves to a school schedule, we plan to vacation around this time each year. Anna dipped her toes in the water a handful of times during last year's trip and I can say she neither loved nor hated the experience. This year was a different story, she L.O.V.E.D. the entire experience ... the beach, the ocean, the sand, and the seagulls ... she loved it all. If we'd let her, or if the seagulls hadn't tempted her away, she probably would have stood at the end of the surf for hours on end letting the waves roll over her tiny toes. 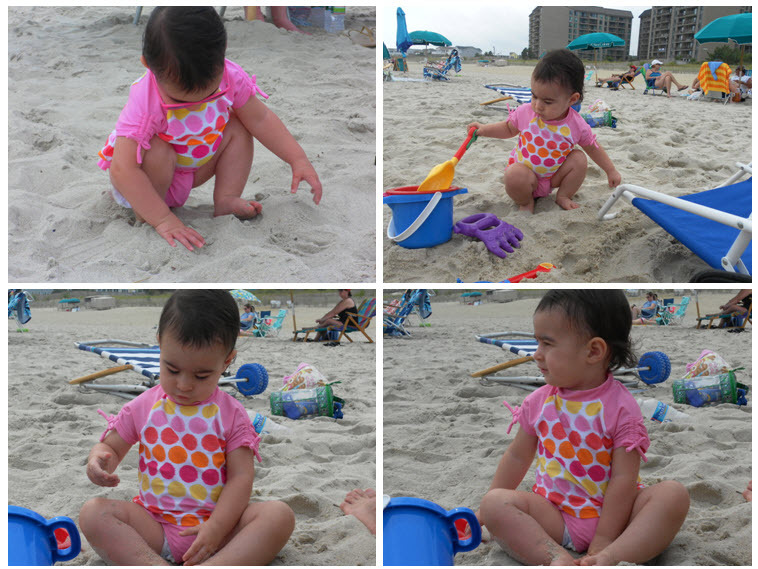 After a couple of days she really got into playing in the sand, with the help of a "hole" dug by Mama. 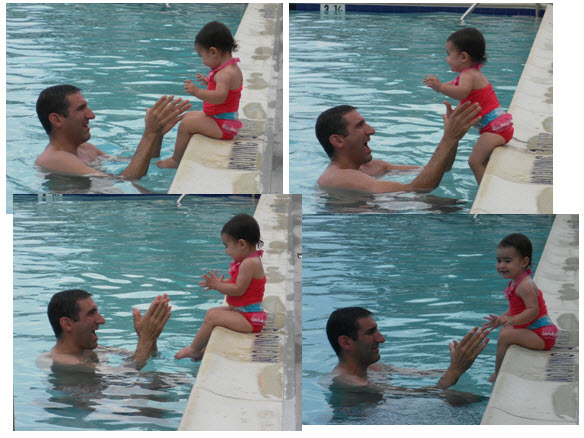 She loved the pool as well and even found the courage to jump off the side and into Daddy's arms. All this said, what I think she loved the most was the 1 on 1 time with her grandparents. She loved having an "audience" at all hours of the day, from the time she woke up until she went to bed. She and Grandpap took many a walk on the promenade and the beach, while she and Grandma walked into town most mornings and took several trips a day to see the dolphins in the lobby. Mike's parents left a day early to stop on the way for a visit with old friends and when we returned that evening after an outing to the Ocean City boardwalk and dinner, Anna was VERY disappointed that no one was waiting for her with smiles and open arms in the condo. Sigh. Just boring old Mom and Dad. 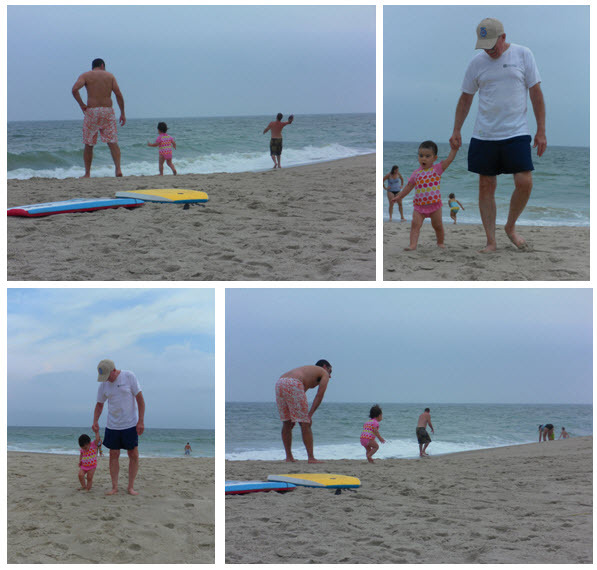 Of course Mom and Dad loved having in-house baby-sitters for 5 days, which allowed us some extra beach time and a date night! It was a win-win-win! Inner-tubin' and enjoyin' life at the beach! Chasing seagulls and waves, all at the same time! Ocean City Boardwalk fun on our last night ... Daddy won me a stuffed froggie! Sunset at dusk ... LOVE this.